Reviews for Faira, a Washington, Arizona, and California savings real estate broker, offers consumers listing savings and buyer’s refunds. Faira is a multi-state savings broker, offers consumers listing savings and buyer’s refunds in select areas across Washington, Arizona and California. Offers savings to sellers (charges 0.5% platform fee to the buyer with an optional 1% listing fee) and commission refunds to buyers (2% of the purchase price). For its in-house listings platform offers self-represented buyers a 2.5% independent buyer discount, to account for the fact that there is no need for Buyer’s Agent Commission (BAC) expense for self-represented buyers. However, we recommend that all Buyers work with their own competitive buyer’s agent who offers a buyer’s refund. Faira also offers Premium Listing option for a 3% listing fee. Faira is a consumer-focused real estate agent that successfully represents consumers across Washington, Arizona, and California and offers sizeable savings. Faira listing service includes posting home on the MLS and MLS Aggregator services, professional photos in addition to all typical services offered by a traditional real estate agent. 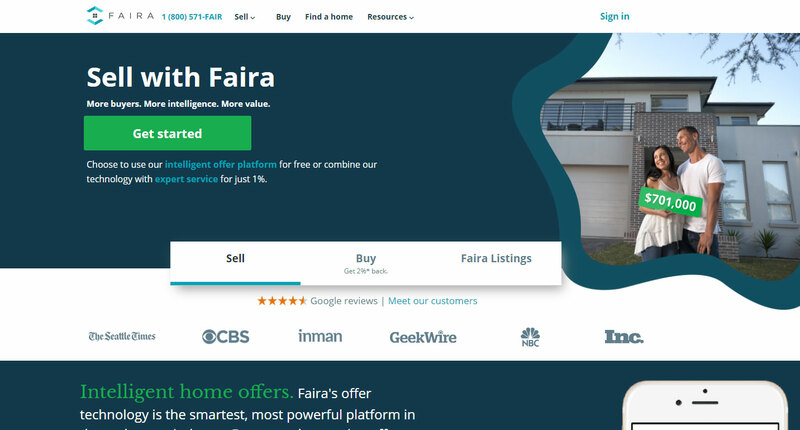 Faira gives sellers access to a well-designed dashboard with great communication features. The pricing model at this brokerage may be an issue for some Buyers and Agencies who are unable to work with it due to the “platform fee” structure. Buyer's commission rebate structure is also subjective with ambiguously defined savings. What is considered standard real estate services are advertised by Faira as Premium for a significantly larger fee. While Faira does offer sizeable savings for Buyers and Sellers, we find that some service offerings by Faira are difficult to substantiate, especially when it comes to its Premium listings.